paper which reflects on important trends in the news media that are having an impact on our community initiatives. The 'theory of change' from-the-grassroots is that there may well be a hundred ideas for action worth gatting on with -- and they each might have an impact on 1% of the problem. paper based on vivian Hutchinson's speech given at the Regional Victoria VolunteerFest held at the Wesley Performing Arts Centre in Horsham, Australia, on 26 July 2012. At the heart of all our work in the community sector is an individual awakening of citizenship. This is a maturation of personal identity ... a ripening sense of yourself which is not defined by what you are getting from society, or what you are entitled to. It is about how you figure out what your contribution is to the common good. Active citizens who are the real creators of our communities. Active citizens are the real stewards of those things that need to be cared for. And it is active citizens who produce the possibilities that our children will inherit. 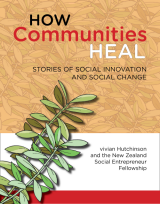 How Communities Heal tells the unique stories of a group of New Zealand social entrepreneurs, and their work to create systemic and sustainable solutions to our social and environmental challenges. paper based on vivian Hutchinson's workshop at the New Zealand Community Economic Development Conference, held in Waitakere, Auckland, New Zealand in April 2011. Communities are the places where we raise children, foster friendship, lead a satisfying life, and look after each other and the earth. Community Economic Development is about how we foster the skills of enterprise, create livelihoods and organise our assets to make these things happen. paper based on vivian Hutchinson's workshop at the New Zealand Community Economic Development Conference, held in Waitakere, Auckland, New Zealand in February 2010. Community Economic Development is about the fostering of those parts of our economy where the common good of people, and the sustainable health of our earth, are honoured and treated as important stakeholders. Basically, it is about the practice of economic development … as if people and the earth mattered. paper based on vivian Hutchinson's contributions to the Philanthropy New Zealand Conference, held at Te Papa, Wellington, New Zealand in March 2009. The Great Depression of the 1930s was one of the most fertile periods in Western history for social innovation ... and our current economic crisis will no doubt demand just as much creativity and innovation from all of us. This paper looks at what social innovation is, and discusses the key role that philanthropy can play in fostering fresh thinking and action on our country’s social challenges. 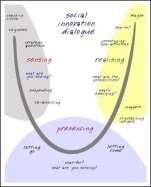 The dialogue process as an incubator for social innovation, and the difference between dialogue and debate. paper based on vivian Hutchinson's presentation to the workshop on "Innovation and Evaluation" held in Wellington, New Zealand in November 2008. How do you measure social innovation? How do you ascertain the value of what’s being done? What are the best evaluation methods to use ? How do funders know they are getting value for money? 700 participants from 40 countries including a rich mix of social entrepreneurs, human rights activists, academics, business leaders, philanthropists and funders ... easily the best conference I have been to in a long time. 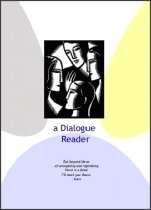 paper based on several speeches by vivian Hutchinson to the Adelaide Festival of Ideas held in Adelaide, South Australia in July 2005. I am highly motivated by the local self-help community employment projects that have made up a large part of my own working life. But once I started to realise that our employment problems are essentially a failure of governance ... I have started on the more obscure tasks of growing the people, growing the active citizenship, and growing the arts of leadership needed to make the better choices that we need today. paper based on keynote speeches by vivian Hutchinson to “A Future That Works — economics, employment and the environment” conference held December 2004 at the University of Newcastle, New South Wales, Australia. You can’t really blame young people for not having the skills that are needed in today’s labour market. unemployment and skill shortages are two sides of the same coin ... they are two sides of a problem that is more about not making longer-term investments in our own people and their skills. paper is based on vivian Hutchinson's speech to the Mayors Taskforce for Jobs national forum “Sharing Great Ideas – Sharing Good Practice” held in New Plymouth, Taranaki in April 2004. A job guarantee for all young people would be confirmation that a real systemic change has taken place in this country. paper based on vivian Hutchinson's keynote speech to the inaugural Tindall Foundation Funding Manager Workshop in Manukau City in June 2003. Unless we can engage in the systemic levels surrounding our social problems ... then we are never really going to find the sustainable solutions we are looking for. paper based on vivian Hutchinson's keynote speech to the Mayors Taskforce for Jobs annual forum in Christchurch in March 2003. The Knowledge Wave conference is growing into an important national forum. It is important because it is probably the closest thing we have in this country to a national conversation on ideas. paper based on vivian Hutchinson's keynote speech to "The Spirit of Youth : Pu Maia Rangatahi — Youth in Local Government Conference", held in Rotorua in May 2002. Social inclusion is about being prepared to make the commitments and investments necessary to ensure all people are within reach of our common aspirations..
paper based on vivian Hutchinson's keynote speech to the "Community Philanthropy in New Zealand" workshop held in Tauranga in March 2002. Our job as New Zealanders is not just to start to define ourselves as generous people ... but to stitch that generosity into the way we run our personal finances, our family finances, our community organisations, our schools, our churches, our marae, our businesses, our governance ... and also our role as a country in terms of world service. paper based on vivian Hutchinson's keynote speech to the Mayors Taskforce for Jobs annual meeting in Christchurch in February 2002. The goal of ending the waste of young people may seem ridiculous to some government advisers ... but we need to understand that these are cultural goals. These are goals which talk about the sort of New Zealand we want to live in. Social entrepreneurs are innovators who pioneer new solutions to social problems – and in doing so change the patterns of society. Like business entrepreneurs, they combine creativity with pragmatic skills to bring new ideas and services into reality. Like community activists, they have the determination to pursue their vision for social change relentlessly until it becomes a reality society-wide. paper based on vivian Hutchinson's keynote speech to New Zealand Mayors gathered in Christchurch in April 2000 to launch the New Zealand Mayors Taskforce for Jobs. The job-rich areas of the future will emerge in two main sectors. The first sector contains the jobs that come from choosing to look after one another better. The second sector contains those jobs that come from choosing to look after the earth better. Both these sectors are very rich in terms of job potential. The Zero Waste revolution will go much further than the older recycling and composting programmes, because it applies “systems” thinking to the dual challenges of environmental degradation and resource recovery. paper by vivian Hutchinson (1999) based on a speech to the Community Governance Forum, held at the Christchurch Convention Centre. Community groups have not just been out there delivering much-needed social services in difficult circumstances. They have been a learning edge amidst a society in change. And the insights and wisdom gained from being at that edge have not always been heard by our current frameworks of governance. paper by vivian Hutchinson (1999) based on workshops to the New Zealand network of Local Employment Co-ordination Groups. We are not going to solve unemployment and create enough jobs for New Zealanders unless a great variety of organisations learn more effective ways of working together. A Regional Commissioner can achieve a great deal to bring focus and effectiveness to this major public challenge. The leadership required here is one that is also able to reach out beyond the boundaries of any one government department. It is a leadership that can inspire and encourage a variety of local groups and individuals to play their part in the overall solution to local unemployment. This is about walking to change what we value. I want to see that the contributions of the poor and the unemployed are valued more in this country. I want to see their right to participation, their right to a fair share of the country’s income, their right to a place at the table to have their say … is honoured within our political and economic framework. Strategic Questioning is the skill of asking the questions that will make a difference. 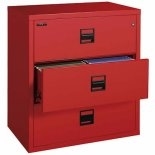 It is a powerful tool for personal and social change. It is a tool for helping people discover their own strategies and ideas for change.